Walnut butter is a perfect healthy alternative to butter, margarine and spreads. This delicious `gourmet` butter tastes wonderful on crackers, bread, toast, muffins, and raw or cooked vegetables. Blend into cooked pasta and rice in place of pesto, mix with maple syrup for a sweet-nutty spread, or whisk into smoothies and shakes. It also gives a nutty flavour to desserts and salad dressings, even making for a tasty dip just on its own. Tastes great straight from the spoon! Keep a spare, unopened tub in the cupboard so you`re never without. Great on crackers, bread and crudités etc. Add to cooked pasta and rice, desserts and salad dressings to enhance flavour. May not be suitable for children under 4 years. Oil may separate naturally from butter. Stir before using. Below are reviews of Omega Excellence Organic Raw Walnut Butter - 200g by bodykind customers. If you have tried this product we'd love to hear what you think so please leave a review. 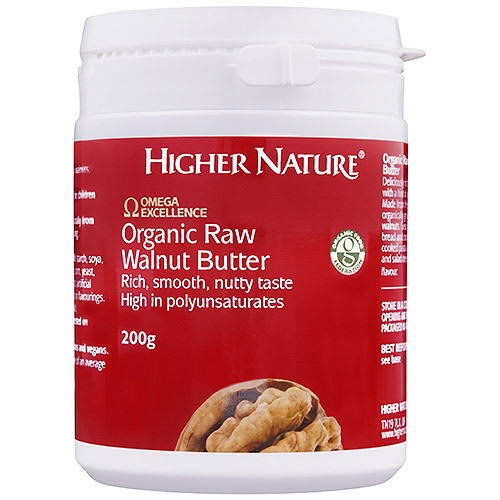 Deliciously rich and smooth with a hint of sweetness, this untoasted, 100% Certified Organic Raw Walnut Butter is made from superior quality, raw walnuts.